Inverness Museum & Art Gallery, Castle Wynd, Inverness. There are well attested reports of "big cats" in the Highlands of Scotland, especially since the 1970's when the British laws relating to the keeping of "dangerous wild animals" were changed. It was very expensive to build acceptable cages for these cats, which had up to this point been "normal" domestic pets, and some owners, unable or unwilling to put a member of their family behind bars on a whim of government, tried to find alternative accommodation. They rapidly discovered that all zoos were over-supplied with large felines, and their pets faced the death penalty. It is quite understandable that some owners decided to give their pets a chance of survival by releasing them into the wilds of Scotland where deer and rabbits cause untold damage to crops, and a little predation might not go astray. Indeed, there are still Government proposals to re-introduce wolves to the Highlands, where they were earlier exterminated in the 1600's. Some animals were quite quickly recaptured, like the Puma caught in Cannich, not far from Loch Ness, by Mr Noble. Lack of sheep persuaded him that there was a predator about, and he constructed a cage trap to try to catch the culprit. He successfully caught a large female Puma, which despite an appetite for mutton also enjoyed having its belly tickled, and lived to a ripe old age at the Highland Wildlife Park in Kingussie, 30 km East of Loch Ness. When it finally died of old age it was stuffed and is now on display in the Inverness Museum, Castle Wynd, Inverness. In recent years, less domesticated specimens have been seen on many occasions, and in 2000 alone there have been reliable sightings of "big cats", both brown and black versions, in many places around Loch Ness and Inverness, one as recent as July 22nd. The sightings suggest a breeding population of at least one species, the Puma. These are usually brown, but black specimens are not uncommon, and they pose no threat to humans. Other possibilities are "black panthers" - actually black leopards* - and these are sometimes less innocuous. However, one would expect a mix of black and normal colouration in any natural population, and I am not aware of any reports of adult spotted specimens. Read more about them here. * Everyone knows that a leopard cannot change its spots, but it can change the colour of the rest of its coat so that they become almost invisible! Black "big cats" have been seen many times around the village of Kiltarlity, a few miles from Loch Ness, where it (they) have been called the Beast of Boblainy, after the locality where they have been often seen. I would like to thank Inverness Museum & Art Gallery for permission to reproduce their postcard of "Felicity" the Puma, and recommend all visitors to the Highland capital to view the excellent collections and displays. HIGHLAND farmers are being warned that prowling big cats could threaten their stock during the lambing season. The alert comes from former Northern Constabulary wildlife liaison officer John Cathcart a, week after a puma was seen and a mutilated sheep was later found in the Ardersier area. "It was a particularly good sighting - in daylight, at a matter of a few feet - of an animal that was positively identified as a puma," said Mr Cathcart. "The witness owns 40-kilo dogs and he estimated this thing was heavier than his dogs. Then the next day there was one sheep found dead in the area. The lamb was still alive, but the mother was just in bits." The Ardersier sighting comes as residents of another Highland area have been alerted to the possibility of big cats on the prowl. The latest issue of the Kiltarlity Community Council newsletter, Kiltarlity News, reports a string of livestock attacks by a mysterious beast in the area over the past two years, including the loss of more than 20 sheep by Eskadale keeper Neil Lyon. Mr Catheart, who has investigated several reports of big cat sightings; and kills, is certain that pumas or similar animals have established themselves in the Highlands, putting lambs and other livestock at risk. "Lots of lambs have been taken," he claimed. "There's one farmer in the Dalcross area who lost 26 lambs last year, and I'm talking about lambs that were taken away completely without any trace." However, despite the long series of sightings, Mr Cathcart says the public remain reluctant to believe in big cats roaming free in the Highlands. "You get wee pockets of belief, but generally it's been Loch Ness monsterised. But there is absolutely no doubt in my mind that there are a number of animals in the Highlands and even going down to Argyll and then Aberdeenshire," he said. "My personal view is that there is a breeding population. I have one sighting from Daviot of a lioness and three cubs. I spoke to the chap himself and he thought it was a lion, but I will contend it was a puma. I think that if it had been a lion, we would have known all about it by now! A puma would give the same silhouette as a lioness, so 1 would say yes, they are certainly breeding." Mr Lyon believes his sheep were victims of a big cat between October 1998 and the spring of 1999 when the mysterious attacks took place. they had been skinned was typical of big cats." However, Mr Lyon believes that the culprit may have had its comeuppance. A local driver collided with a mystery animal between Kiltarlity and Drumnadrochit. Hairs were sent off for analysis to Napier College in Edinburgh, where experts concluded they belonged to an animal that was not native to Britain. "Since then we haven't had any trouble, touch wood," said Mr Lyon. However, Beverley Wilson of the National Farmers Union believes lambs are more likely to fall victim to more mundane predators than pumas or panthers, with dogs and foxes the prime suspects. "Nine times out of 10 or more, if you have a sheep kill, it will be a dog," she said. "This is why we say when it's lambing time, please keep your dogs inside, or at least know where they are. Even the friendliest Labrador can do a tremendous amount of damage if it gets among sheep." And as someone who used to live on Dartmoor, home of Britain's most notorious big cat, the legendary Beast of Bodmin, Miss Wilson admitted to taking claims about puma kills with a pinch of salt. I would have to see it to believe it," she said. 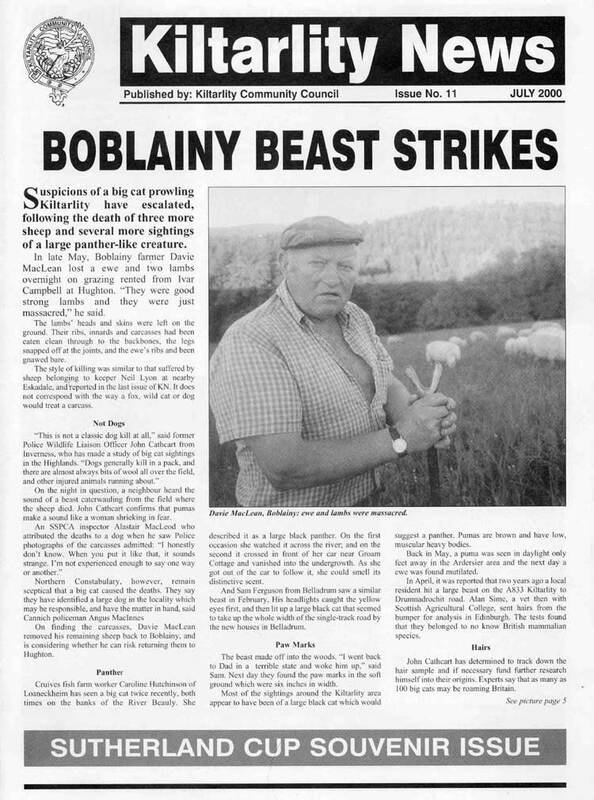 Front Page of July 2000 issue of Kiltarlity News. Copyright (C) 2000 Kiltarlity Community Council. If you find the page difficult to read on your monitor, a plain text version of the article is at the bottom of the page. The July issue contained 20 A4 pages of local interest material, and the next issue is expecting in November. Where is all this going on? Suspicions of a big cat prowling Kiltarlity have escalated, following the death of three more sheep and several more sightings of a large panther-like creature. In late May, Boblainy farmer Davie MacLean lost a ewe and two lambs overnight on grazing rented from Ivan Campbell at Hughton. They were good strong lambs and they were just massacred," he said. The lambs" heads and skins were left on the ground. Their ribs, innards and carcasses had been eaten clean through to the backbones. the legs snapped off at the joints, and the ewes ribs and been gnawed bare. The style of killing was similar to that suffered by sheep belonging to keeper Neil Lyon at nearby Eskadale. and reported in the last issue of KN. It does not correspond with the way a fox, wild cat or dog would treat a carcass. This is not a classic dog kill at all, said former Police Wildlife Liaison Officer John Cathcart from Inverness, who has made a study of big cat sightings in the Highlands. Dogs generally kill in a pack, and there are almost always bits of wool all over the field and other injured animals running about. On the night in question, a neighbour heard the sound of a beast caterwauling from the field where the sheep died. John Cathcart confirms that pumas make a sound like a woman shrieking in fear. On finding the carcasses, Davie MacLean removed his remaining sheep back to Boblainy. and is considering whether he can risk returning them to Hughton. Cruives fish farm worker Caroline Hutchinson of Loaneckheim has seen a big cat twice recently, both times on the banks of the River Beauly. She described it as a large black panther. On the first occasion she watched it across the river : and on the second it crossed in front of her car near Groam Cottage and vanished into the undergrowth. As she got out of the car to follow it, she could smell its distinctive scent. And Sam Ferguson from Belladrum saw a similar beast in February. His headlights caught the yellow eyes first. and then lit up a large black cat that seemed to take up the whole width of the single-track road by, the new houses in Belladrum. The beast made off into the woods. I went back to Dad in a terrible state and woke him up, said Sam. Next day, they found the paw marks in the soft ground which were six inches in width. 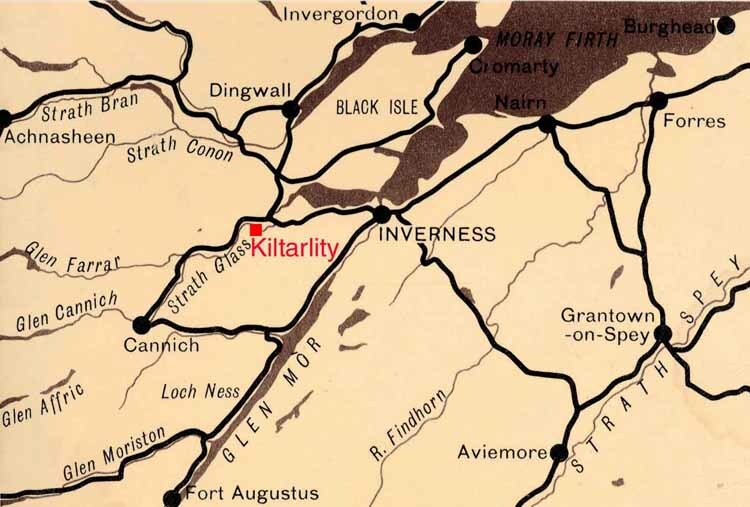 Most of the sightings around the Kiltarlity area appear to have been of a large black cat which would suggest a panther. 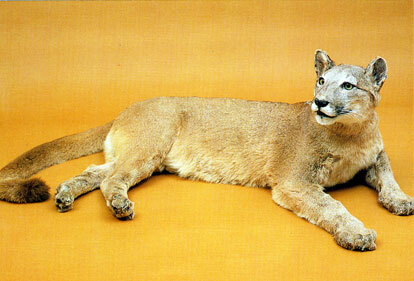 Pumas are brown and have low, muscular heavy bodies. Back in May. a puma was seen in daylight only a few feet away, in the Ardersier area and the next day, a ewe was as found mutilated. In April, it was reported that two years ago a local resident hit a large beast on the A833 Kiltarlity to Drumnadrochit road. Alan Sime. a vet then with Scottish Agricultural College, sent hairs from the bumper for analysis in Edinburgh. The tests found that they belonged to no known British mammalian species. John Cathcart has determined to track down the hair sample and if necessary fund further research himself into their origins. Experts say that as many as 100 big cats may be roaming Britain. In a bizarre twist, the Aberdeen "Press and Journal" refused me permission to reproduce a puma story written by one of its Inverness-based reporters on the grounds that "they could not control what I did with it". As someone who has been misquoted on numerous occasions by the P & J over more than 30 years with never a single apology, I regard their decision as an insult.